It’s winter and you’re leaving home for warmer climates. You pack your swimsuit, sunscreen and beach supplies and soon you’re off to a much-needed vacation. Protecting yourself from the risk of illness or injury while you’re abroad is the absolute last thing on your mind. But what would happen to you in the event of an emergency? Would your existing health insurance cover the expenses? Not if you’re on Medicare. If you’re on private insurance, you might or might not be covered for a medical emergency (and even if you are, you might have to pay it yourself when it happens, and get reimbursed later). Travel medical insurance can provide you peace of mind by covering you for overseas hospital care, intensive care, outpatient treatment, and much more at an affordable price. What would you do if you were incapacitated during your trip? An emergency medical evacuation back to your home country can cost more than $100,000, according to the U.S. Centers for Disease Control and Prevention. Most travelers think that an overseas disaster can never happen to them, but sometimes the worst-case scenario does occur. Think about it: if you suffered a severe injury overseas, you could end up paying for an ambulance ride, extensive medical treatment at a foreign hospital, and possibly the cost for a loved one to join you and accompany you back home. Our Atlas Travel Insurance provides a $500,000 maximum lifetime limit (not subject to deductible or coinsurance) for an emergency medical evacuation. That coverage could protect you from dipping into your retirement savings or kids’ college fund to pay for significant medical expenses. See Description of Coverage for details. Consult the Traveler’s Checklist from the U.S. Department of State before you leave for your international trip. 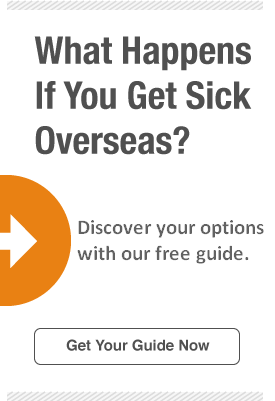 You’ll also want to determine how much your existing insurance will cover you when you’re overseas; if it won’t cover you at all, then you need to strongly consider getting a travel medical policy for while you’re gone. Next determine what’s important for you as far as coverage. If you’re not going to be driving or won’t be participating in adventure sports, then those won’t be important considerations for you in selecting coverage. Our travel medical insurance can bring you peace of mind because you won’t have to worry about the worst-case scenario of paying the entire cost of a medical emergency out of pocket. Atlas Travel Insurance not only gives you affordable coverage but also includes 24/7 customer service. Get a free quote today.